Journalism in the Twenty-First Century: To Be or Not to Be Transmedia? Transmedia content has been the subject of several studies in the field of fiction, sustaining relative unanimity about the characteristics that this kind of content should have. In the field of journalism, the situation is fairly different due to its particular specificities. Multimedia, intermedia, or cross-media are often wrongly used as synonymous of transmedia, although there are important differences between all these concepts. In part, this misunderstanding is motivated by the fact that all of them relate to convergence processes in journalism, but a more detailed analysis allows us to find differences, highlighting transmedia as the most complete concept. This chapter proposes a framework that can support journalists in the production of transmedia contents that conveniently explore the characteristics of the involved media, using formats and languages that better fit the story, and enabling the user to engage in the interpretation, change, and distribution of these contents. The exhibition of highly successful series and movies has aroused the attention of the scientific community to transmedia contents and has contributed to an extensive discussion, which has helped to explain this concept when applied to fiction (Scolari, 2009, 2014; Gosciola, 2012; Bona & Souza, 2013). In journalism, the situation is quite different due to the field’s specificities. Notions as intermedia (Rajewsky, 2002), multimedia (Salaverría, 2005) or cross-media (Veglis, 2012) are often confused with transmedia given their similarities, though they have important differences. In the first part of this chapter, the author will present a detailed analysis to allow finding differences between diverse concepts about transmedia, emphasizing the difficulty to apply transmedia to journalism due to the complexity of its application in an activity where short-term periodicity is paramount. As a starting point, the author uses the considerations about transmedia storytelling initially discussed by Jenkins (2003, 2006) because their simplicity help to transpose them into the field of journalism. To the author, a story can be considered transmedia when: 1) It is expanded through different media, formats and languages; 2) each of the story contents is autonomous, has a proper meaning and can be used as an entry point into the narrative; and 3) the audience participates in the story through the aggregation of elements and their sharing. Jenkins compiled in his blog in 2009 what he has called the core principles of transmedia storytelling, which have been updated/improved over time. Those principles are: Spreadability vs. Drillability, Continuity vs. Multiplicity, Immersion vs. Extractability, World building, Seriality, Subjectivity and Performance. The simultaneous verification of all these conditions in a journalistic environment can be difficult due to their intrinsic characteristics, constraints related to production time, and a lack of human resources in the newsrooms. 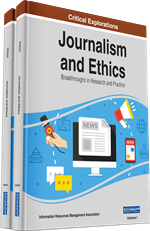 In the second part of the paper, the author explores those same principles in Moloney’s (2011) perspective when applied to journalism. In the third part, the chapter focuses on an example of a successful Portuguese transmedia journalism product called “E Se Fosse Consigo?” [What if it Were You? ], a TV show expanded to a second TV channel, press, sites and social networks. Lastly, the paper delineates an indicative framework that can support the producers of transmedia contents in the elaboration of products that conveniently explore the characteristics of the involved media, using the formats and languages ​​that better fit the story and enable the user to engage in the interpretation, change and distribution of these contents. Having explained the approach to the concept of transmedia, and its transposition from fiction to the journalism field, the relation between journalism and the future remains to be understood, as mentioned in the title of this work. That is, why is there this link between transmedia journalism and journalism in the XXI century? Recent studies show journalism trends for the next few years and among them are some that fit perfectly into transmedia journalism. The increasing consumption of online news has been reported every year by the Reuters Institute Digital News Report (Reuters Institute, 2017), which also confirms the increase in accesses to Internet through mobile devices (Rosenstiel & Mitchell, 2012). The use of these platforms facilitates the personalization of consumption (Lorenz, 2014) and the participation of users (Kammer, 2012), allowing the passage “from the monarchy of content to the republic of users” (Aguado & Güere, 2013, p.64). Other phenomena linked to transmedia journalism, such as the use of news gamification (Ferrer Conill & Karlsson, 2015), confirm that the future of journalism could undergo a transmedia process.